Linden Endowment for the Arts: SkyDance V debuts this Wednesday - reserve your seat! SkyDance V debuts this Wednesday - reserve your seat! The fifth production SkyDance production Innocence End, hosted by the LEA and UCSville Machinima Expo, will formally debut at 7PM Pacific Standard Time, Wednesday, January 30, 2013. This brand new show will introduce an unprecedented 4000 meter (4km) reactive-interactive stage set that is repeatedly and dramatically transformed over the hour long performance as seating flies through gravity defying monoliths of breathtaking beauty. Founded in 2006, the SkyDance is one of the first Second Life ensemble performing arts groups. The 2006 debut was in-world but also part of the 2006 ZERO1 Biennial exhibition in San Jose California (50,000 people attended). The SkyDance is not automated or animated. 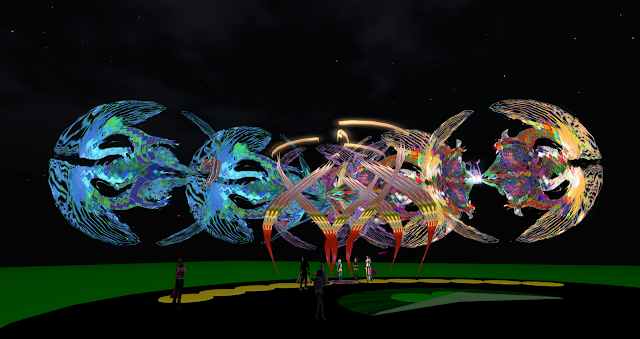 Performers pilot their avatars and perform precision 3 axis choreography manually. SkyDancers actually build parts of the stage as they perform and trigger sound samples that make the musical part of the program unique every time. This is the 5th complete new production, and everything in the SkyDance is made specifically for it. 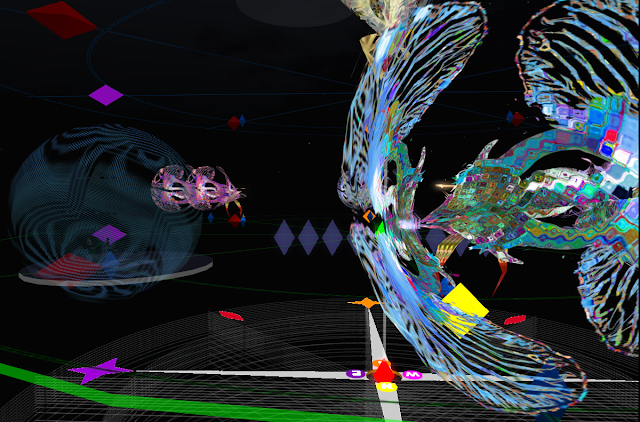 SkyDance V has an original score by composer Josh Zamo, and produced by DC Spensley (DanCoyote Antonelli in SL). SkyDance V's stage set is over 3 kilometers in height and scale is an important part of the show. 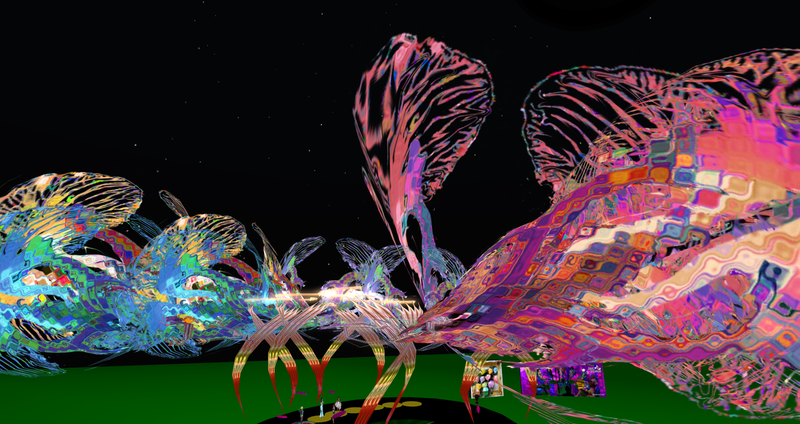 All the performers wear costumes (called Cascades) that are meant to be seen from great distances in SL (400-500 meters) rendering the figurative avatar invisible. The costumes become the characters in the narrative and are decidedly non-figurative. 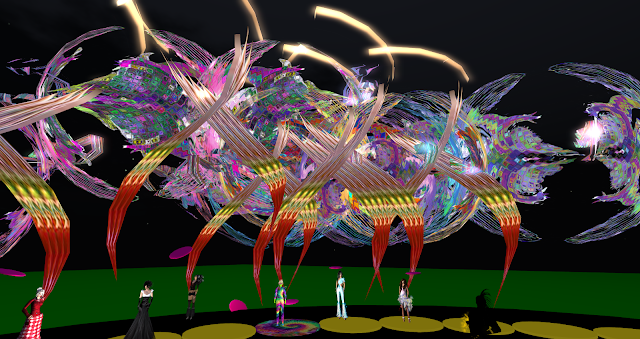 This is one of the central challenges of the SkyDance project, to depict a drama without figuration, through location, interaction and choreography of the performers. SkyDance V takes a cue from experimental playwright Augusto Boaln and provides a mechanism for the audience to interact and decide the outcome of the story conflict. The director, DC Spensley "calls" the show in real time over voice using a language similar to air traffic control developed over the last 6 years of the production. SkyDance V seating is limited, but the show will run twice a week during during the subsequent 90 days, to accommodate the most guests possible. There is FREE limited reserved seating for this event. * For seating information, please contact Spensley directly at dc@dancoyote.com. *Please note: An earlier SkyDance press release indicated that advance tickets were available for a sliding scale donation to this event. The LEA is an independent committee that grants artists free land sponsored by Linden Labs, and as such commercial activities such as ticket sales and selling artwork or other products are prohibited. However, reserved seating is necessary for some larger events, and tip jars may be available for voluntary visitor contributions at LEA-sponsored exhibits and events, all proceeds of which go solely to the artist(s). Please contact Spensley as above for reservations, and support the artists with a donation if you like at the event. 7PM SLT is a hopeless time for europeans, but maybe they think US is the whole world? Thursday is Jan. 31 on my calendar. Jan. 30 is Wednesday.